Scones are such a yummy snack with a cup of tea or coffee. But, really, you might as well eat a donut because scones are usually every bit as fattening and the donut just might taste better! These scones, however, have a whole-grain, low-sugar base but are amped up with a mouth-watering combination of sweet white chocolate and tangy dried cranberries. My all-purpose gluten-free flour blend can be substituted cup-for-cup for the whole wheat flour and produces an equally delicious wheat-free treat. (Click here for the recipe.) My kids love getting one of these in their lunch box or as a special after-school treat. I love them any time of day! Mix dry ingredients (flour through salt) together in a large bowl. Cut in butter and combine until mixture resembles bread crumbs. (I think the easiest way to do this is with your fingers.) Add cranberries and chips. In separate bowl, combine buttermilk and vanilla, then gradually add to the dry ingredients until a soft, sticky dough is formed. If the dough seems too dry, add more buttermilk, a tablespoon at a time, being careful not to over-mix. Pat dough into a 6-8-inch circle, depending on how thick you prefer your scones, and cut into 8 wedge-shaped pieces. I like to pat the dough out on a piece of parchment paper and then transfer the wedges to a baking sheet covered with a clean piece of parchment. Bake at 450 degrees for about 13-15 minutes (will vary slightly depending on how thick you make your scones) or until they are golden brown and pass the toothpick test. For extra crunch and decadence, brush the tops of the scones with buttermilk and sprinkle generously with sugar. Broil for a minute or so, watching very closely as sugar will brown quickly. How many scones does this recipe make and do you know how many calories in each scone? They look really good! 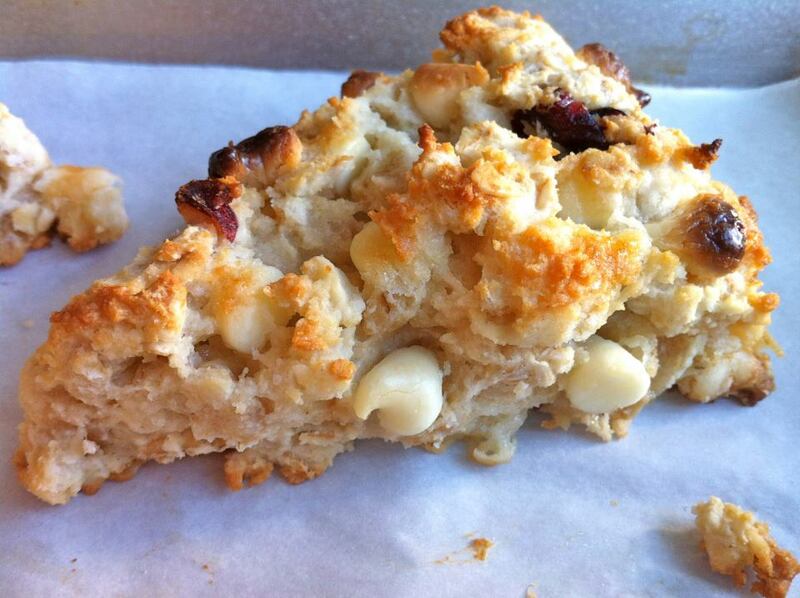 This recipe makes eight scones…and thank you, Helen! How would these do with fresh cranberries?